Like most of the other Washington shops, we are participating in the Row by Row Experience, which is a summer long shop hop. It is happening in many other states, is no cost to the consumer, and started on July 1st. You will have all summer (until September 2nd to be precise) to stop by participating shops and pick up your free ‘row’. 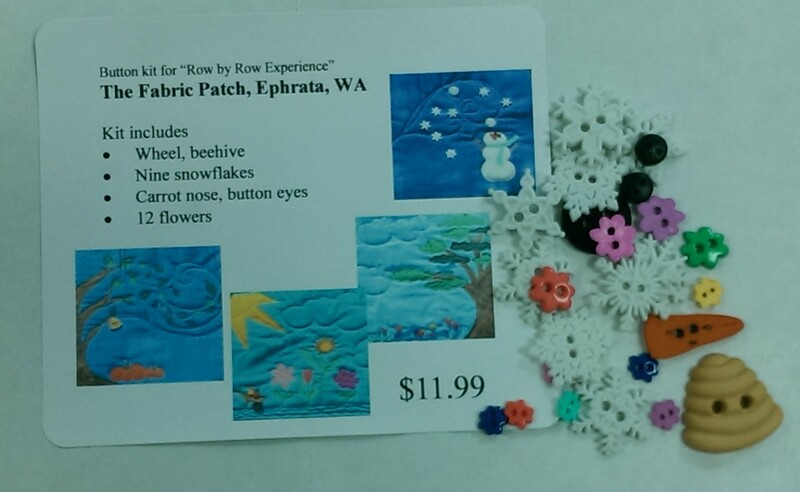 The rows are 9 1/2″ x 36 1/2″, each shop has designed their own personal row with a “seasons” theme. The patterns are all original and different. Fun to collect!! The best thing (besides free, unique patterns) is that when you complete a quilt top with at least eight rows and bring it to a participating shop… you win 25 fat quarters!! Now, there are rules… you have to be the first one to claim the prize at that shop (one winner per shop) and you can only claim a prize at one shop. But hey, pretty simple…. fun to play!! I had a hard time designing my row. Mostly because my biggest issue is my indecisiveness. 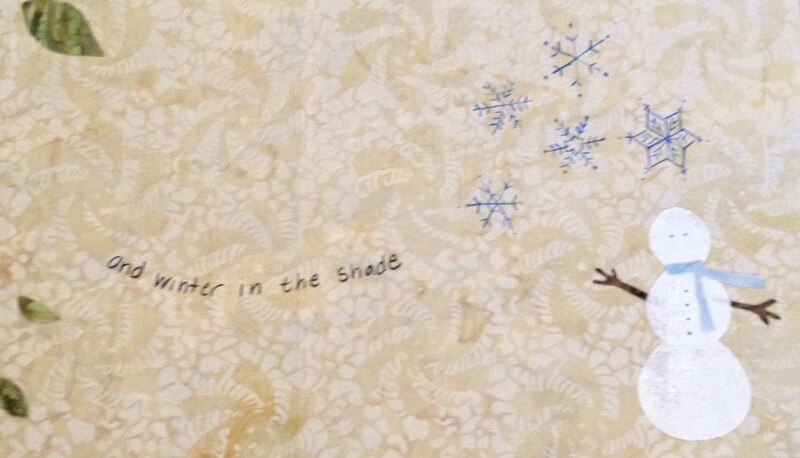 The theme was “seasons”, we could pick one season, two, do all four…. 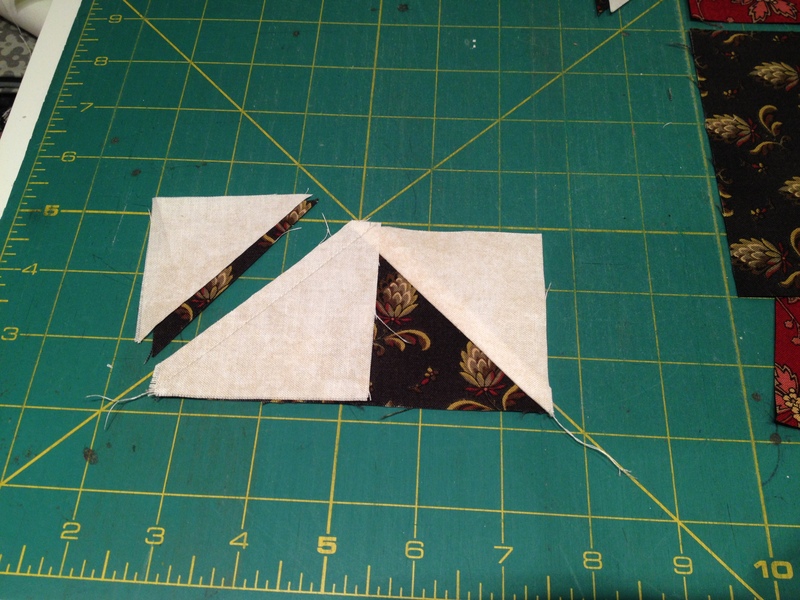 it could be pieced, fused, embellished… OMG. Too much to decide!! So I made a fourth and final draft. I am pretty happy with it. I opted to make the four seasons individual which I think is more versatile, and easier for the beginner, and I used buttons instead of embroidery. I also used fusible web, which is not always popular, but I really don’t know why. I love it!!! 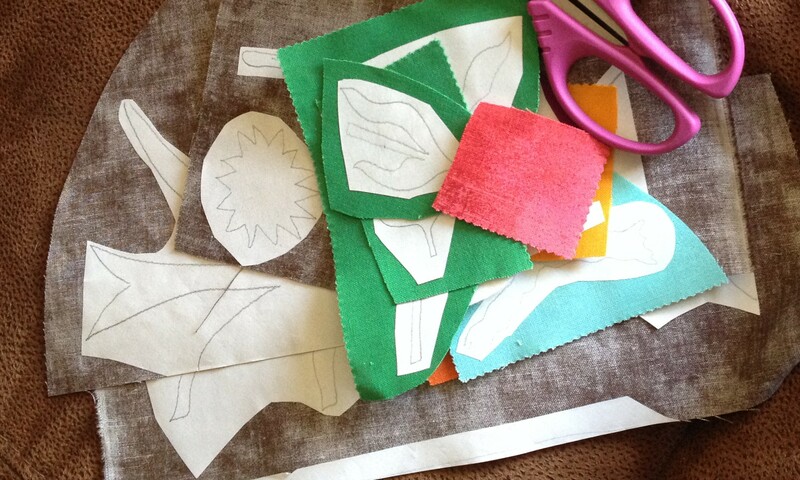 So simple, so fun, so easy to reproduce a pattern onto a pillow, a towel, a bag, a shirt, a label, a center quilt block…. super fun and endless possibilities. 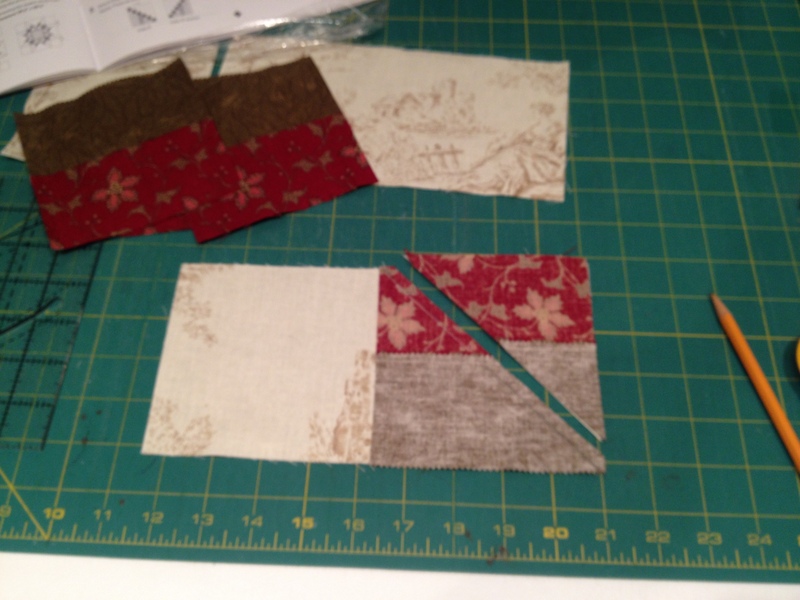 If you are not familiar with fusible web, this is how I made my row…. 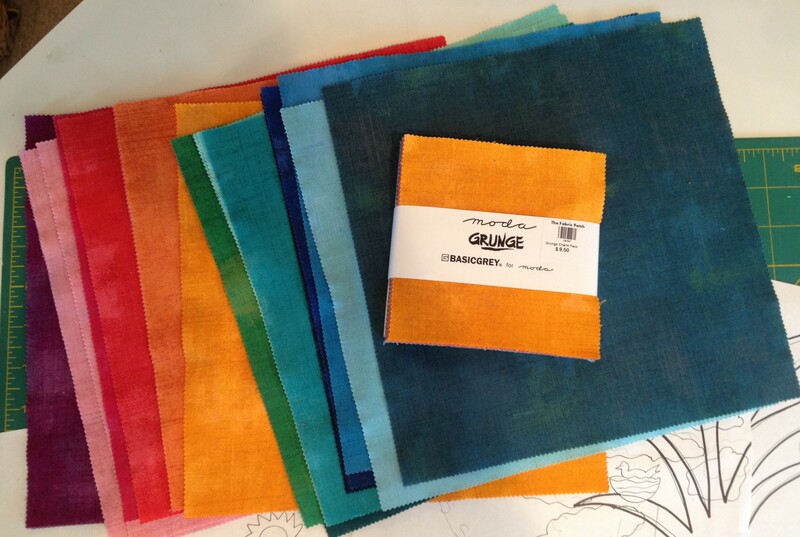 Start by picking your fabrics. I wanted something textured that was going to read solid, so I picked Basic Grey’s “Grunge” fabric. It comes in yardage, layer cakes, charms and jelly rolls. 36 fabulous colors!! I used a layer cake so I could pick my favorite four for my backgrounds. 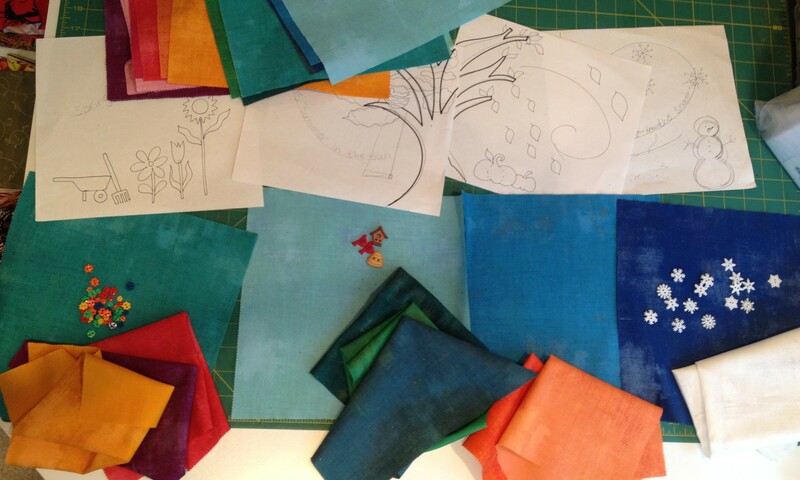 I have my pattern drawings so I know what I’m looking for (flowers… leaves… etc). I also selected the buttons I wanted to use. They were bright, I wanted the colors to look good together. Incidentally, we put together a button pack with all 26 buttons for you for only $11.99. 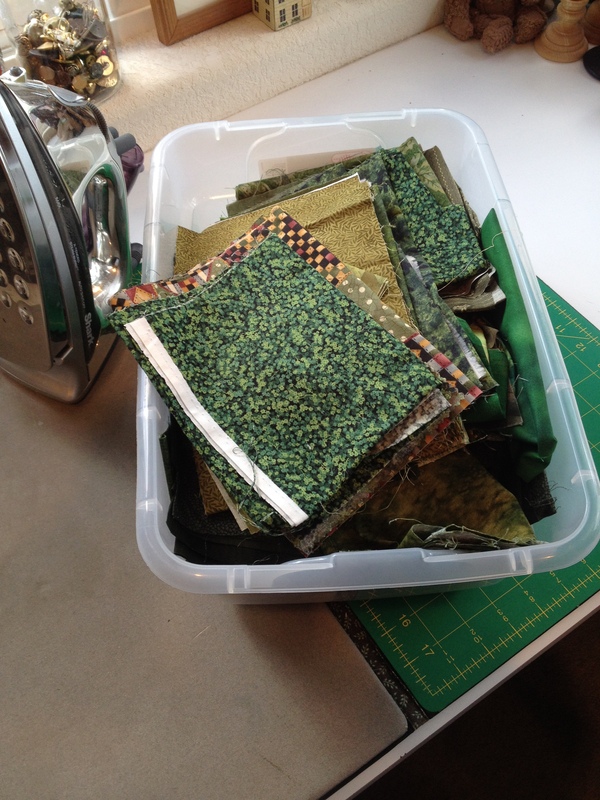 We also put together a fabric kit for $19.99 that also includes the 26 buttons. Next it’s time to start the fusible web process. Fusible web is the the term used for both the product and the technique. There are several brands of fusible web. The old standby ‘Steam a Seam’ is no longer my preferred fusible. They recently went through a change with their release paper and I don’t like it. 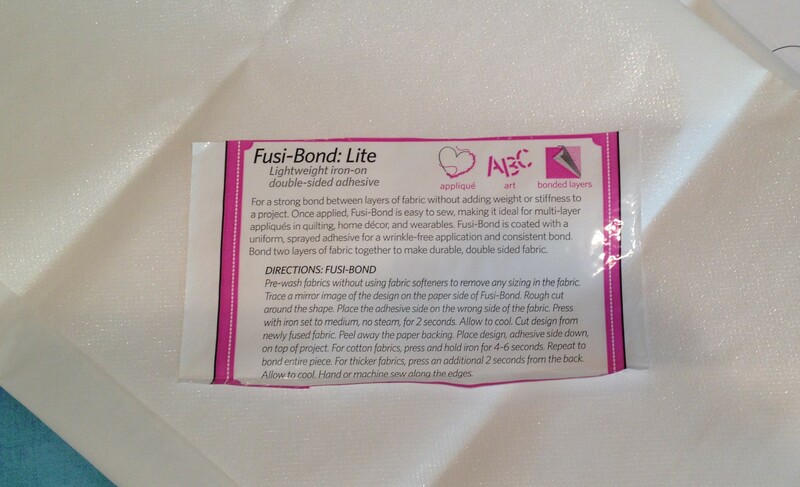 There are several other brands out there, but by far my favorite is Lazy Girls new product ‘Fusi-bond Lite’. It is affordable, easy to use, consistent quality and comes on a bolt. 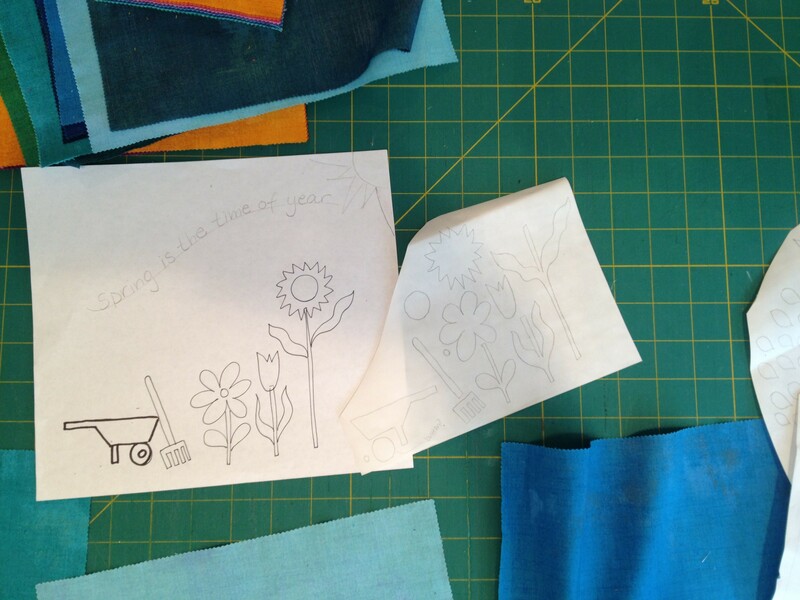 To use, you trace the pattern onto the paper side of the fusible web, when you trace it you want to make sure all of the ‘components’ of the flowers and individual items are separate. Trace all of the images this way. I separated the blocks, just to keep track of my pieces easier. Then iron the images onto the back side of your fabrics. The reason I used batik for my first version is I like the fact that there is no right or wrong side to batik fabric. It makes it easy when you can’t make a mistake!! But again, for this version I have my grunge fabrics. I also, again, rough cut around the pieces just to make them more portable. Now it’s time to cut them out. I like to sit in my comfy chair in my jammies with my standing ott lite. I have my pieces on a paper plate (I would like to say I have a pretty vintage serving tray that fits nicely in my lap… no such luck). I do have a lap tray that I use with my computer and with embroidery, but for fusible pieces you really want something with a “lip” so you don’t lose your little bits. 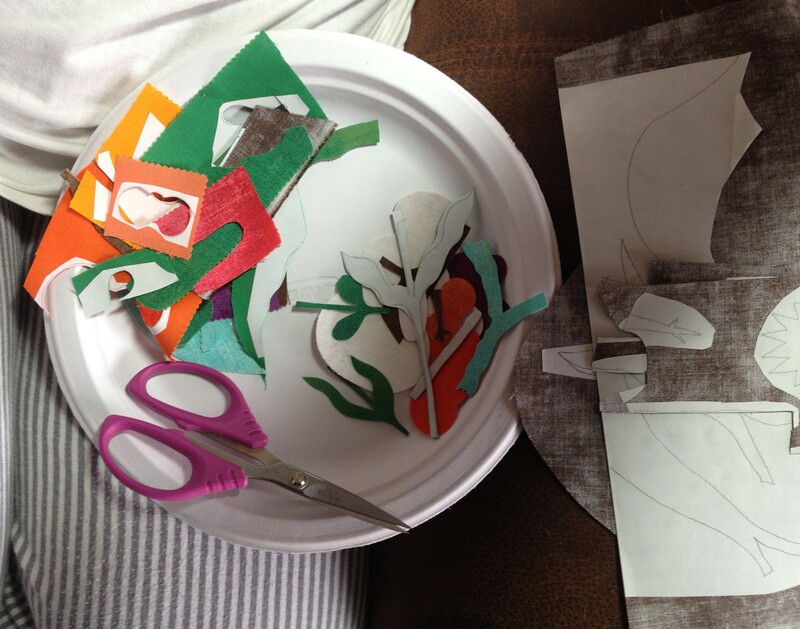 I use the paper plate to hold the little cut pieces and my trashy bits. My favorite cutting scissors are the purple handled scissor by Karen K. Buckley. They are teflon, so the fusible won’t gum up your scissors, and they have a nice serrated edge, so cutting fine points and small edges is a breeze! 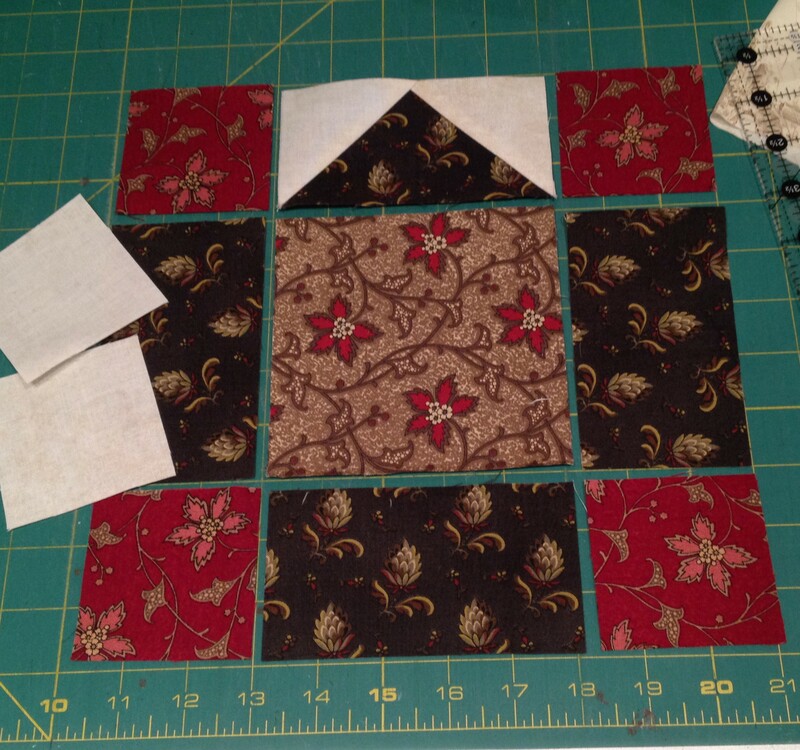 After everything is cut, it is time to arrange the pieces on the background block. Peal off the paper backing, and once you have the design the way you like it, iron it in place. You will want to “press” your iron, don’t drag it across the fabric. If you drag it, you may disrupt the arrangement. The fusible web is not permanent. It will stay in place until you have time to stitch it down. 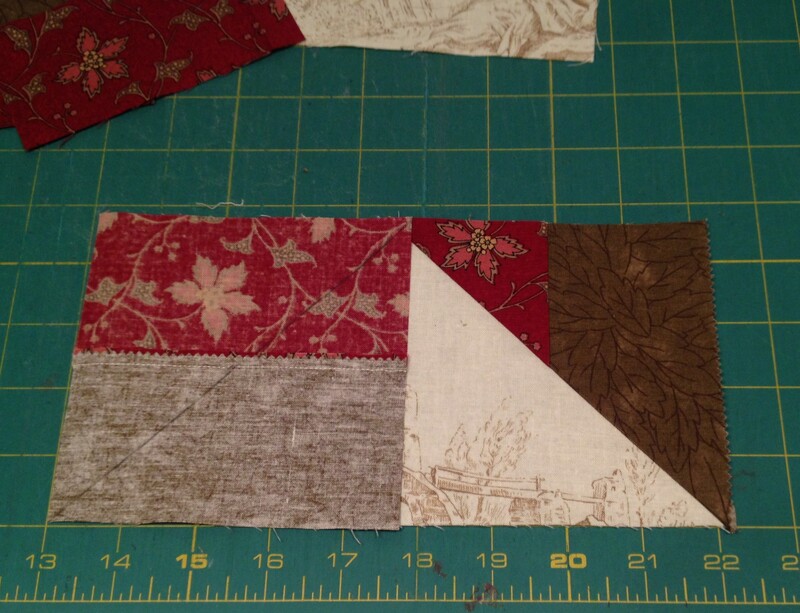 I prefer to stitch it down during the machine quilting process. SO… I hope you all decide to do join the Row by Row Experience! It is going on nationwide. 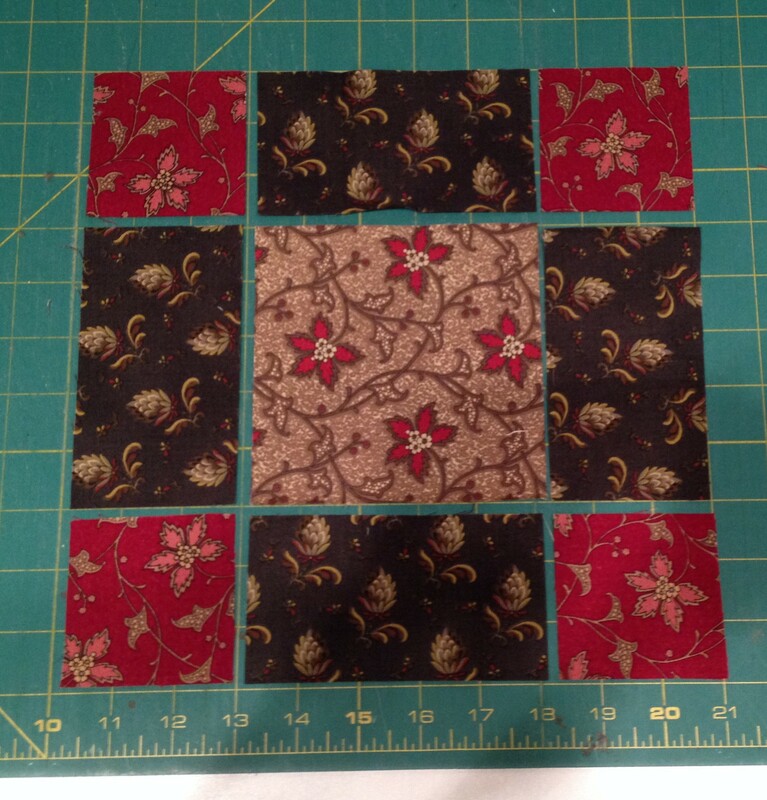 If you have quilting friends or families near a shop in Pennsylvania, Texas, California… etc…. 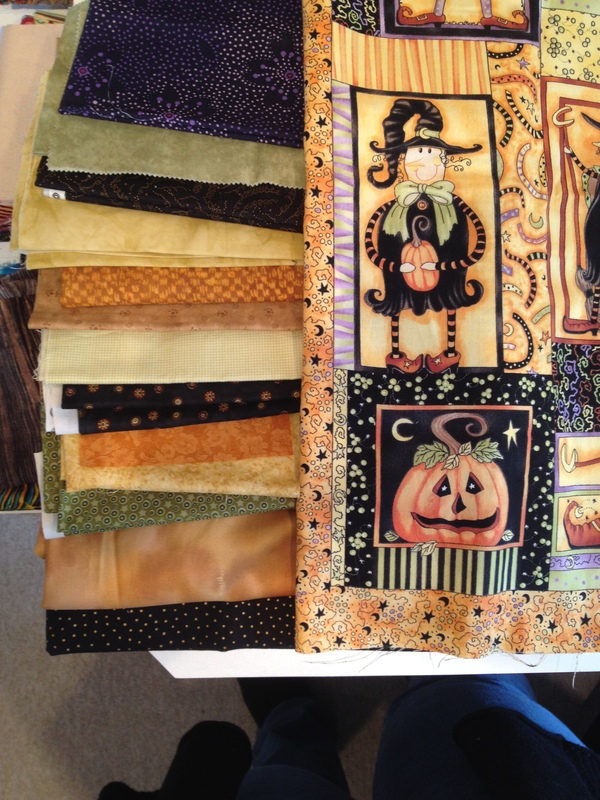 have them go in and get you a pattern… what a fun themed collection for a great quilt! Incidentally… one other rule I may have failed to mention… the patterns have to be picked up in person, since the idea is it is a shop hop. So no mailing any patterns. Bummer. Tomorrow is a “quilt-in-a-day” class called Crumb Cake. Super simple pattern, addicting, and it truly uses up every “crumb” of fabric. It’s a funny story about this pattern. About 7 years ago a frequent customer came in with 14 Crumb Cake quilts she made in one month! When I asked her about the pattern she told me she made it up. She did a class at the local guild and showed us all how to make it. We were hooked! I asked her if I could write the pattern up for her and she reluctantly agreed. I had it written up within a few days, giving her full credit on the “by” line. It was a popular pattern, I sold hundreds and gave several classes, always giving my customer her full credit and monetary reward. Then, a few years later, while at market in Houston, I walked by the Embellishment Village booth and noticed the Crumb Cake pattern. I stopped and looked at it. It was the same quilt, with a copyright date of 1996!! I was horrified. I am very much a “rules” girl, I would never copy a pattern (knowingly) and of course it is a crime… punishable with a $25,000 fine! 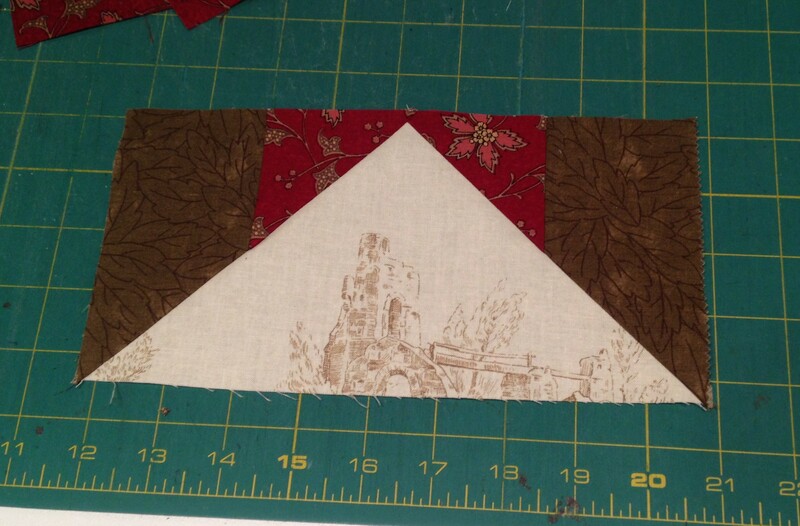 We quickly removed our patterns and replaced them with the Embellishment Village version. We never spoke of it again until they took their pattern out of print in 2009. At that time I contacted them and confessed my story, asking if I could republish the pattern. They said it would be fine if I kept the name the same, and mentioned that our version (we did construct it a little differently) was inspired by Embellishment Village. 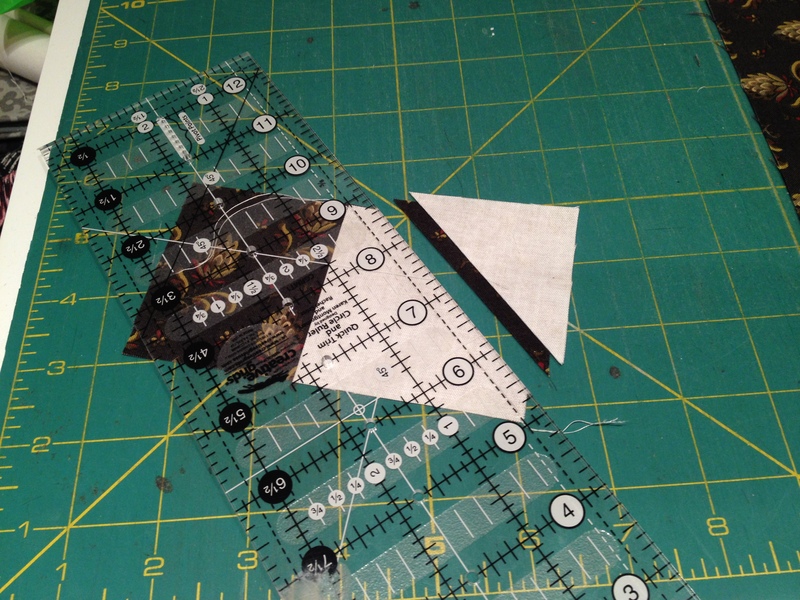 So, after narrowly escaping incarceration… the pattern is still a favorite of mine and the shop! My class tomorrow will be attended by Rachel, our new office manager. She has been trying to learn how to quilt and tomorrow is her second class. You can follow her fun blog “Frazzled Patch” as she takes beginner classes and explains foreign words like “jelly roll” and “square up”. I am getting Rachel’s fabric ready tonight. 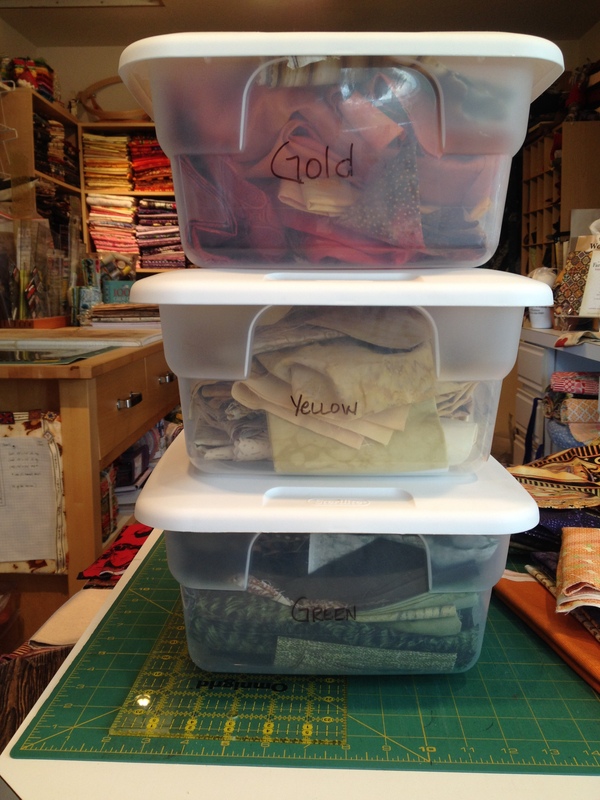 The best part about the Crumb Cake is it uses up stash fabrics, leftover strips, bits and pieces, and it is a great use for those panels we collect but don’t know why…. I have selected a panel that would be great for Rachel. 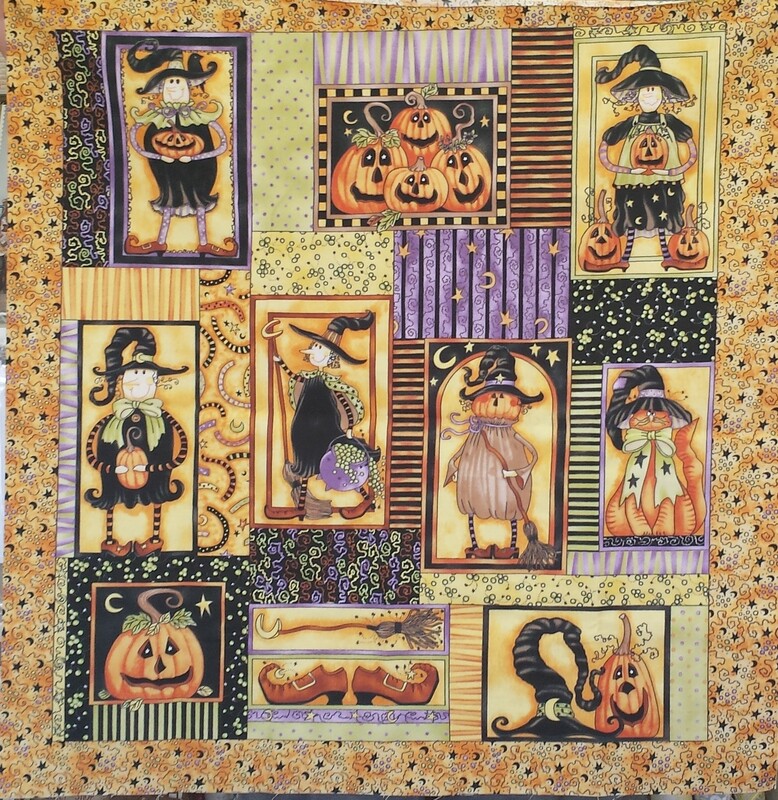 This is an older Clothworks Halloween panel that is super cute and will be perfect for Rachel and her two darling little boys. Now I just have to find about 12 fabrics that would go with it. We can also use “bits”. I tend not to save a lot of little pieces. After all of these years I just find that I don’t use them up. Everything on my fabric shelves is more than a yard. I have two drawers with just panels, and I have a few shelves with full fat quarters. But, I do have a secret stash of bins. They are labeled by color, and they have smaller pieces. They are in the closet, and not used often enough. Crumb Cake is a perfect pattern to wittle those down a bit…. OK, Rachel’s project kit is ready. 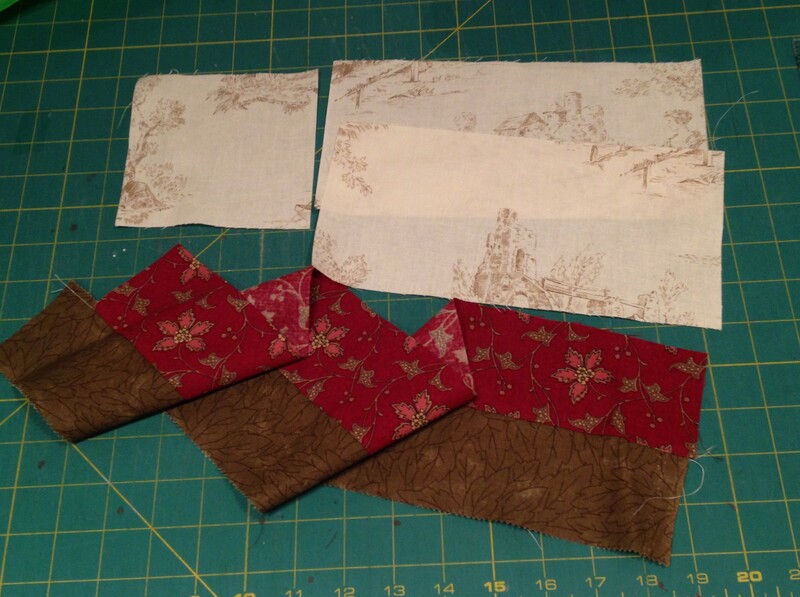 I will spend a little time cutting some strips and sewing some panels together so that I have a working sample to teach from… and Rachel has a head start!! I have some certainty Rachel will blog about her adventures in the class tomorrow. She will also show the steps. 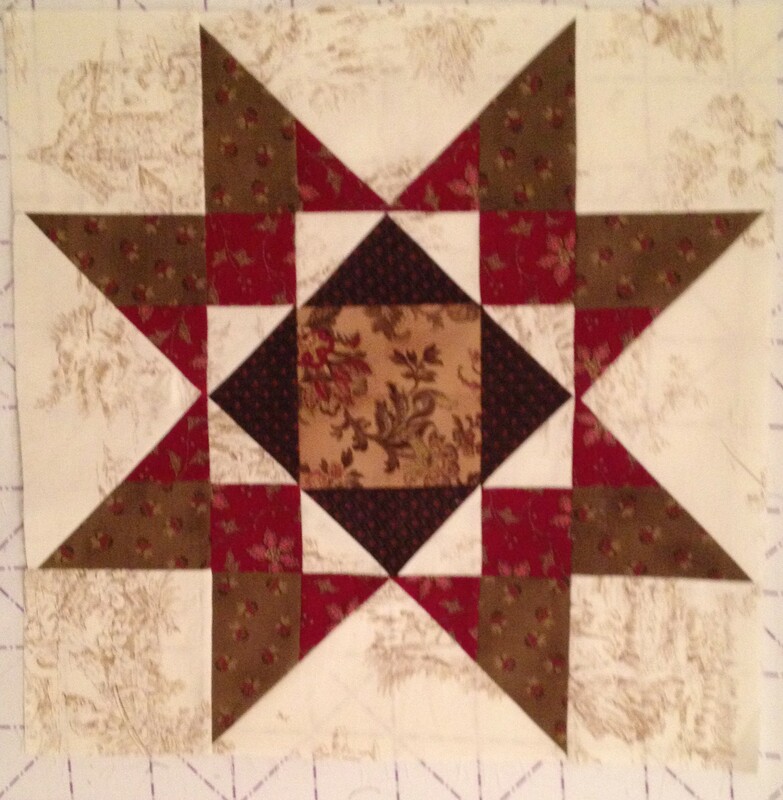 We can hope the finished quilt will appear soon! In the meantime… I have another one of these cute panels left. Just like the one I gave Rachel. I would like to give it away. Rachel tells me there is some way to fairly do a drawing using a “counter”? maybe I have that term wrong. Anyway, I think all you have to do is “like” this post. We will draw a name on Friday, announce it, and we will put it in the mail to you!